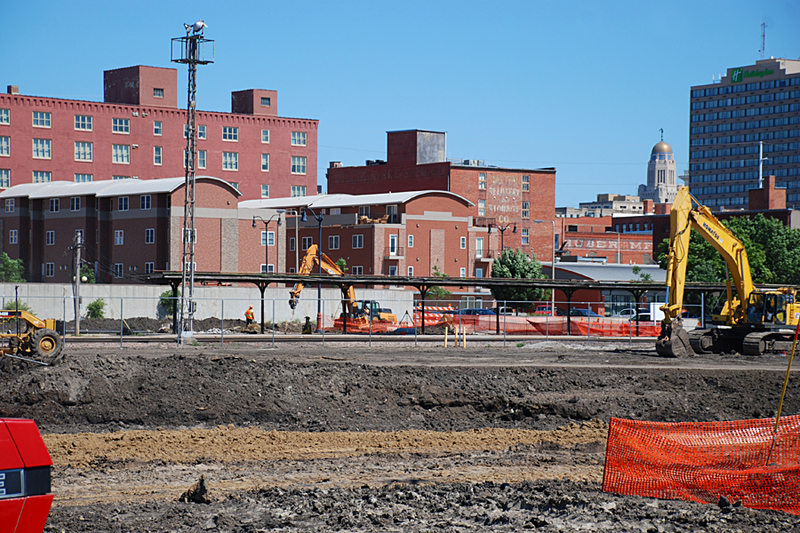 Construction of Lincoln's new arena is underway just west of the Haymarket District. It was front-page news today in the Journal Star: On Monday, the City Council will vote on a 30-year lease with UNL for the arena. But the lease looks pretty much like the “memorandum of understanding” that the city and UNL signed off on last year. During the arena groundbreaking, it was somewhat alarming to see Nebraska Athletic Director and the UNL mascot missing, and even more alarming to learn the city and UNL had not yet signed a lease. So now, here it is, and it is the same deal we were told it would be before the election. The upshot? UNL basically gets to have its men and women basketball teams play in the arena for about nothing. Sure, UNL is supposed to pay $750,000 in rent, but they get so many credits that arena program manager Dan Marvin told me long ago that it’s basically a wash for them. The credits are all turnback sales tax receipts the city receives from the sale of basketball tickets (70 percent of the state sales tax), the first dollar of all ticket surcharges on basketball tickets and $300,000 for UNL’s lost concessions revenues. • Just in case you didn’t pick up on this during the campaign, UNL “shall have no responsibility or liability for repayment of the bonds” that were sold to finance the $340 million project. “Except as otherwise expressly provided in this Agreement, the Parties recognize and agree that any Arena components or services identified in this Agreement shall be at the City’s sole cost and expense.” So no matter what, even if we slip into the second Great Depression, repayment is the city’s responsibility, not UNL’s. • The lease says “although plans and specifications for the arena have not been completed” (really? ), “there are certain components of the Arena and the Basketball Space required in order satisfy the needs of UNL.” In other words, they’re gonna build it the way UNL likes it — right down to promising to re-seal the basketball floor every summer and repainting it every five years. • There will be a minimum of 2,000 student seats — with the location determined by a design working group comprised of city and UNL representatives — and a portion devoted to risers for students to stand on, if UNL wants them. And the risers will belong to UNL — if another event wants to use them, they’ll have to rent them from UNL. • UNL retains all gross income and revenues from sale of merchandise, UNL suites, club and floor seating, UNL ticket sales, naming rights, signage and broadcast rights or other intangible rights in connection with signage and ribbon boards and scoreboards. • In addition to using the arena for 30 home games per basketball season (15 men’s, 15 women’s), UNL may schedule use of the arena for up to 15 non-basketball events per year (such as commencement ceremonies) without paying additional rent. • UNL promises to try not to schedule games during state high school volleyball, basketball and wrestling tournaments. • The city intends to charge a $1 surcharge on all event tickets, but may increase that up to $3 if the money is needed. • The city will have the right to selling naming rights for the arena, and UNL will sell naming rights for the basketball court, locker rooms and other UNL spaces. • If the city fails to get the arena built in time for the 2013 basketball season, the city will have to pay UNL $100,000 for each of the first two games delayed, $200,000 for each game after. In addition, the city would have to provide UNL the use of Pershing Auditorium free of charge for any women’s basketball game that must be relocated or rescheduled because of the construction delay. • No “adult-oriented” nor political advertising will be allowed during UNL events (TransCanada, we’re lookin at you) and any casino, alcohol and tobacco ads can only be digital, so they can be removed for UNL events. Lincoln – here’s to your arena!:/cheers! Ummm…. wait… UNL – here’s to YOUR arena! I’m just glad I’m paying for it. Let me know when I can use it…. Good name for the arena, The LEMON. to match the DITCH at 19h and ZERO street. We are building the arena for the university and we could end up owing the university money if the arena that we are paying for isn’t built on time? I don’t remember being told this before we voted on this arena! Can Lincoln survive another antelope valley? This certainly isn’t out of line nor unexpected. Standard business practice. A few years ago, the company I work for was to be the lead tenant in a new office building. Darn right we had provisions written into the lease whereas we would be compensated by the owners of the new building if it was completed by the agreed upon date. Fortunately, it was done on time, and we moved in as planned. Look at the dollars the university stands to loose if the new arena isn’t done on time. It’s simply smart business for the university to protect itself. As long as the city holds up its end of the bargain, this is a non issue. You are so right ej. This is a bargain for the university. The city just rolls over for UNL. By the way , what is this thing going to look like? I don’t see it as the city rolling over. The city wouldn’t get anyone to sign a lease agreement without providing those provisions. I don’t care whether it’s the university or the Dallas Mavericks, no entity in its right mind would sign a lease without protecting themselves should they end up without a place to play. WOW who would have thunk? Bend over Lincoln, here we go again. Lincoln 0 University 4-5-6-7- where does it stop? Not until we get someone in the city government with some b—s to say HELL NO to the university, sorry guys you are on your own. There needs to be people recalled and fired over this, good God is there not one lawyer out there willing to help stop this mess pro-bono? Think not, they are all on the side of big money and the university. This needs to be halted NOW to protect the tax payers. Get over it, Roger. The university is the primary tenant. The city and the university benefit from the terms of the lease. Without this 30-year lease, we would have no new arena. I know you would rather have the state fair, but I’m pretty sure that ship has sailed. I doubt that UNL really wanted this arena. This was the doings of the city with all the fanfare about private donations and no environmental problems. The only win I see for UNL is that it will allow improvements to Devaney for volleyball season and maybe a few more of us can get tickets. Glad the lease is this way! Remember when Mr Osborn said if we didn’t get a new arena they would have to spend over 20 million bringing Devaney up to University Stadards? Plus he couldn’t recruit good ball players without a new arena. Guess what he still put over 20 million in Devaney and he got the taxpayers to pay for the new arena and he is still going to make money on the deal. If Lincoln voters wouldn’t have approved financing for the new arena, the university would have spent $20 million to make Devaney into a decent basketball facility; volleyball still would be played at the coliseum, where thousands of fans would remain locked out and the university would continue missing out on a significant revenue opportunity; and Lincoln still would be stuck with Pershing as its only event center. The way it worked out works out much better for all. Husker basketball gets shiny new state-of-the-art facilities; more fans get to see Husker volleyball in person, while the university gains ticket sales and concessions revenue; and Lincoln finally gets a replacement for Pershing.